The cops vs teachers basketball game is a really fun for everyone, but it also has a serious purpose. This year’s contest between the teachers in the Hastings Area School System and the local law enforcement (aka cops) will be Wednesday, April 25 at 6 p.m. at Hastings High School. The event will benefit the Cystic Fibrosis Foundation. 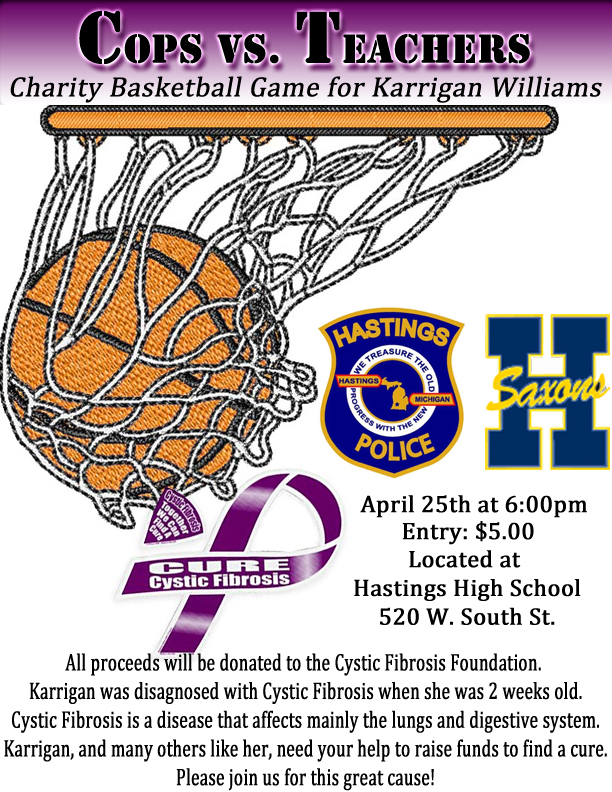 This year’s game is staged for Karrigan Williams, daughter of Brooke and Brett Williams of Hastings, who has Cystic Fibrosis, Hastings police Sgt. Kris Miller said. The money raised will go to the Williams family, to be forwarded to the foundation for research in Karrigan’s name. Mom said the Karrigan, 8, is really excited about the evening, and she and Brett are happy about the awareness being raised. The idea came from the first grader’s school, Star Elementary. Sometime during the event, Karrigan will be introduced to the crowd, mom said. She’s pretty shy sometimes so probably won’t make a speech. While the oldsters catch their breath at half time, the kids will take the floor to shoot baskets and play a version of musical chairs involving successfully shooting a basket, and a three-point shooting contest. There is also a chance to win a kayak, and other giveaways. Sports announcer Todd Possett promises to keep the game reporting lively, with play by play along with comments and analysis of the local talent. The concession stand will have refreshments available. "It’s just for fun. It brings the community together, and will raise awareness of Cystic Fibrosis. It gives the families a break, a chance to think about something else, and it’s fun working with the teachers,” Miller said. Sports buffs will recognize this as the opposite of trash talk; trying to buy the game by making the teachers overconfident, and then overpowering them. There is no reward for the players other than bragging rights, at least until the next game, but they all enjoy working for the local community and rising awareness of good cause and neither side will give an inch on the court. Never mind the score; it will be a good game for a good cause and a fun evening. The cost is $5 at the door, which opens at 5:30 p.m., tip-off is at 6 p.m.
Sponsors of the event include Southside Pediatrics, Total Health Center, Wal-Mart, Miller Real Estate, Bailtek, and Farmers Insurance. “We have 25 donors all told,” Miller said. Organizers have already raised $1,000 selling t-shirt from Courtside Screen, and $848.54 in a penny war coordinated by Courtney Coats at the Hastings Middle School. (left) Last year's participants line up for a photo. The game was played for Leo Loeks, who stands in front of the teams. (below) This file photo shows the intensity of a cop vs teachers basketball game. Look for more excitement at this year's game April 25.